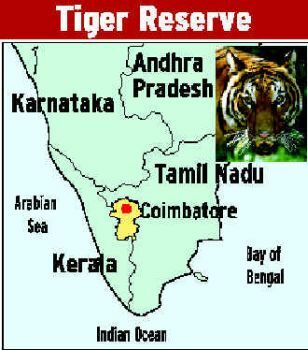 CHENNAI: With saving tigers high on the national agenda, Tamil Nadu is all set to host its second Project Tiger reserve. A State Forest Department proposal to declare the Indira Gandhi National Park and Sanctuary in the Anamalais range in Pollachi, Coimbatore, as tiger reserve, was cleared by the Project Tiger Steering Committee in New Delhi and has been forwarded to the Planning Commission for its approval. A formal notification will be issued in the next few months, sources in the steering committee told The Hindu. The funding component is yet to be finalised. Out of the total fund allocation, the recurring component would be shared equally by the Central and the State Governments while the rest would be borne by the Centre. Apart from the Anamalais, seven new Project Tiger reserves in other States would be notified soon. The Indira Gandhi National Park and Sanctuary, with a combined area of 95,860 hectares will be the second Project Tiger reserve in the State after the Kalakkad-Mundanthurai tiger reserve in Tirunelveli district, which houses 29 of the State’s 88 tigers, according to the 2001 national tiger census. Popularly known as Top Slip, the Indira Gandhi National Park and Sanctuary, at an altitude of 1,400 metres above sea level in the Western Ghats, is home to tigers, panthers, elephants, gaur, leopards, rusty spotted cats, bonnet macaques, common langurs, Nilgiri langurs, giant squirrels and flying squirrels, apart from the endangered lion-tailed macaque. The move to notify yet another national park as a Project Tiger reserve was met with mixed reaction from naturalists and conservationists. While most of them welcomed the prospect of enhanced allocation of funds and better infrastructure for Tamil Nadu, they wanted the authorities to draw up a locale-specific conservation strategy for Anamalai’s fragile but biodiversity-rich rainforest ecosystem. "Apart from the tiger population, which is likely to be more than that of KMTR, the area houses an elephant reserve. Declaring it a Project Tiger reserve would augur well for the elephants too. However, the idea needs to be scientifically translated on the field for it to be successful,’’ said Ravi Chellam of the United Nations Development Programme, who was instrumental in setting up the KMTR in the mid-1980s. "The Anamalais are extremely important for any conservation experiment. But the authorities should get the science of forest management right and post the right personnel," Shekar Dattatri, wildlife filmmaker, said.